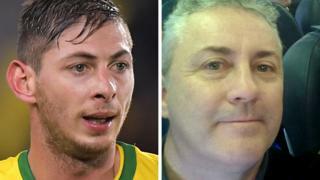 Mr Ibbotson, from Crowle, Lincolnshire, was flying Cardiff City's Emiliano Sala from Nantes to the UK when their plane crashed near Guernsey on 21 January. The footballer's body was recovered from the wreck on the seabed, but Mr Ibbotson's body has not been found. An inquest into the death of Sala was opened and adjourned at Bournemouth Coroner's Court. The court heard that he died of injuries to his "head and trunk" and was identified by his fingerprints. Investigations launched by the police, the Air Accidents Investigation Branch and the Civil Aviation Authority are estimated to take between six to 12 months to complete, the court was told. Mr Ibbotson's daughter Danielle told ITV's Good Morning Britain she repeatedly rang his mobile phone when told by police the aircraft was missing. "He was amazing, I was so lucky to have him as a dad. I know it might take a long time but I don't want this to just be it," she said. Ms Ibbotson said she wanted a search team to "just to go down and have a last look, a proper look". The pilot's wife Nora added: "We're still holding on a little bit. Obviously we do know he's gone but we want him back. "We can't leave him out there on his own." France and Paris St-Germain striker Kylian Mbappe has donated £27,000 to the appeal to find Mr Ibbotson's body.